Former Shoulder Pain Sufferer Reveals “4 Strategies To Reduce Pain” and Prevent Injury From a Unique 3-Step Method That No One Else Will Tell You About. It’s true, close to 40% of all injuries related to resistance training affect the shoulder, making it the number one cause of pain in the gym. Doesn’t that make you wonder how some people are able to train with 100% effort month after month, without ever having to slow down due to a nagging injury caused by shoulder pain? And it doesn’t seem like they spend extra time warming up or have to limit their exercise selection? But first I’d like to share with you 4 Strategies to Avoid Shoulder Pain that were taught to me by injury specialist and exercise physiologist Rick Kaselj, MS.
I’ve spent a lot of time and money consulting with Rick, so be sure to pay close attention and take notes. These 4 strategies could be the difference between a nasty re-occurring shoulder injury versus taking the fast track to the pain free “limitless” workouts you crave. When it comes to warming up prior to a workout most people are not doing anything to prevent a shoulder injury which we’ve learned is the most commonly hurt body part. You’ll see guys that are doing arm circles and arm crosses before their workout which is fine, but this does not hinder an injury. The circles and crosses help lubricate the joint but does nothing to prime up the actual muscles in the shoulder which is what you need to do. 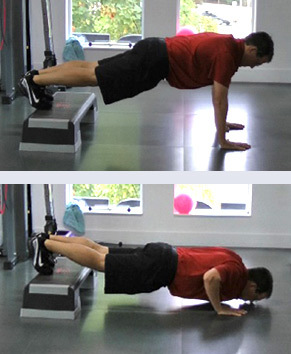 There are several exercises you can pick from but my favorite is the elbows back full range of motion bodyweight push-up with feet elevated on something. Quick Fix: During your warm up add resistance to wake up the muscles of the shoulder, rotator cuff and shoulder blade so they are ready to protect and prevent a shoulder injury. A couple of years ago, before meeting exercise physiologist Rick Kaselj, MS I found myself caught in this vicious cycle after injuring my shoulder while competing in powerlifting. At some point in your lifting career you come home and your shoulder just feels extra sore and you know something isn’t right so you take some anti-inflammatory pills and throw an ice pack on. It’s not a big deal and part of playing sports and training hard right? Hopefully in a few days it will be completely better, but usually some kind of discomfort or pain lingers. That’s no reason to miss a workout though. I know what’s on your mind, you can always avoid a few exercises that cause it to flare up or just train legs. Eventually this gets old and if it doesn’t feel better after a few weeks or months it’s probably time to visit the doctor to find out what’s going on. After using up a sick day and sitting for an hour in the waiting room it’s pretty annoying when the doctor tells you to rest, ice, and don’t do things that hurt. Seriously? If your insurance isn’t that great you’ll probably have to go back to your primary care doctor to get a referral to see a specialist. They’ll have you do an MRI which is super expensive. You’ll have to schedule another appointment for that though. You are advised to go to a physical therapist. If you’re in luck, your therapist has worked with athletes in the past. But who are we kidding? Most of the people in the center are not physically fit at all. Once your insurance runs out or you think you know the stretches and strengthening exercises well enough you can continue with the rehab on your own time. If it still doesn’t feel better it’s time for another MRI……cha-ching, the cost is really adding up fast. In my case this entire cycle lasted 6-months, but others aren’t so fortunate. The worst part is it can keep perpetuating itself and you can find yourself going through this pain cycle over and over. Hopefully you’re asking yourself…Mike, how do I make sure I don’t get caught in this crooked traditional shoulder pain model? I’m glad you asked and my reply is outlined in strategy #3 below. Before initially going to the doctor I researched a lot of alternative shoulder rehab solutions. With these traditional shoulder pain programs, they focus on stretching and strengthening. This does not work or at best provides temporary shoulder pain relief. The reality is that stretching focuses on symptoms, not necessarily the problem. While strengthening is important, it needs to be done when the shoulder joint has been reshaped into a pain-free shoulder joint. 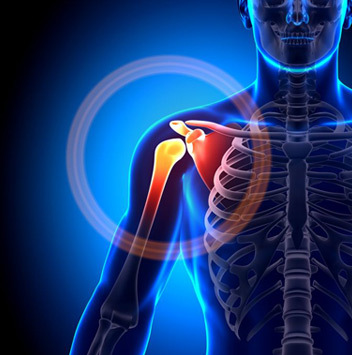 If you have not reshaped the shoulder joint into a pain-free joint, you are just adding more strength to a painful joint and making the problem worse. In time this stress leads to repetitive shoulder injuries, increased shoulder joint damage and shoulder pain. In the next strategy I’ll share with you how to re-shape your shoulders so that when you strengthen them you will NOT be causing more damage. 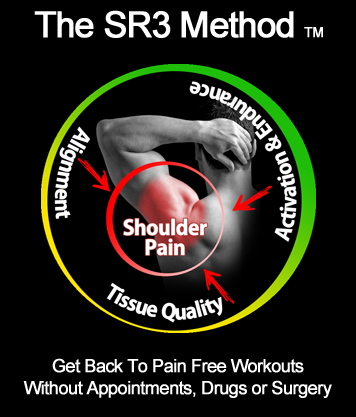 The SR3-Method is short for “Shoulder Reshaping 3-Part Method”. 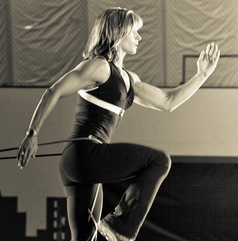 It was invented by Injury Specialist and Kinesiologist Rick Kaselj, MS who has over 16-years of hands on experience, and a masters degree in exercise science. Remember in the traditional shoulder pain cycle above I mentioned how the doctor simply told me to not do what hurts? The entire reason I came in for the visit was to get back to what I love doing, not stop doing what I love. In my case it was powerlifting. 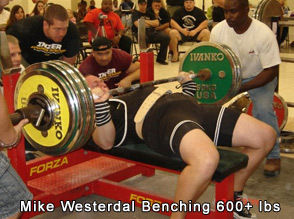 Prior to tweaking my shoulder I had just set a personal record by bench pressing over 600 pounds in competition. The doctor I met with was used to dealing with patients like my mom who don’t work out or play sports. For her maybe the advice, “Don’t do what hurts.” would suffice, but not for me! I wanted to get back in the game and off the sidelines. After getting diagnosed with a rotator cuff tear that did not need surgery I decided to take matters into my own hands. More accurately I trusted my own care to the hands of Injury Specialist Rick Kaselj, MS. Working in the fitness industry myself I knew I had to go to the source of the knowledge and cut out the middle man. You see Rick is more than just a specialist. 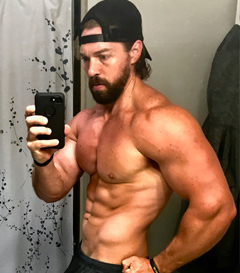 He’s the guy who teaches the other fitness professionals the newest techniques to help their own clients. 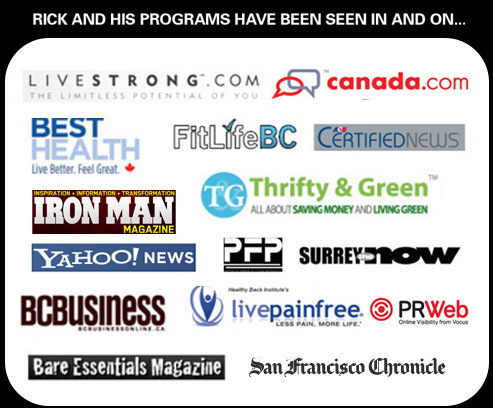 He has given over 315 live presentations to over 6065 health and fitness professionals across Canada and the USA. Within minutes of trying a few techniques Rick recommended I started feeling better. Within a few weeks of following his protocol I felt like a new person. No more sleepless nights and half speed workouts. Nope, I had my mojo back and my wife took notice! In fact, Rick helped my wife Courtney too. He figured out that all her years of playing high school and college volleyball had led to an annoying overuse injury. Her tendonitis had gotten so aggravating that she quit playing club volleyball. The irony in all this is that if Rick hadn’t helped me get rid of my shoulder pain she probably would have never bothered addressing hers. She told me she just figured it was messed up for good and she could work around it since it didn’t bother her around the clock but only during certain activities. Well that was the past. After implementing Rick’s methods she’s feeling great too and to prove it she signed up to do the Tough Mudder adventure race with me this December in Tampa. After improving the quality of life for my family, I became a “believer” in Rick and practically begged him to team up with Critical Bench and allow me the privilege of sharing his new Fix My Shoulder Pain System utilizing his trademarked SR3 Method. What Is The SR3 Method? The “Traditional Shoulder Pain Model” involves endless cycles of appointments, investigations, stretching and strengthening. After having hundreds of Rick’s clients follow this model with minimal success, he needed to find a new model that breaks the traditional shoulder pain model and moves clients from painful shoulders to pain-free shoulders. This led to the creation of the SR3 Method which is based on one key concept: Reshaping your shoulder from a painful shoulder joint to a pain-free shoulder joint. I know it sounds amazing but let me show you how you can do this for yourself and have your painful shoulder move into a pain free shoulder. The first part of the SR3 method involves using the concept of alignment. In order to begin reshaping your shoulder you need to make sure your shoulder joint is in ideal centration – the best possible position. The SR3 method will show you how to do this. The second part of the SR3 method is improving tissue quality. With ongoing pain and injuries the tissues change over time. This leads to the shoulder reshaping into a painful shoulder joint. This could cause dysfunction, less movement, poor circulation, less malleable muscles, stiffness around the shoulder joint and tight ligaments. This all ends up affecting the positioning of the shoulder blade, leading to the shoulder blade changing its tilt. This biting tilt leads to the most common shoulder injury – a rotator cuff injury. 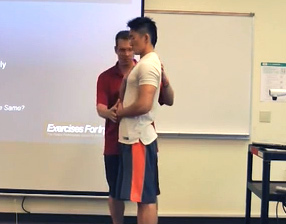 The SR3 method will show you how to reposition this tilt and experience a pain free shoulder. Activation is turning on the right muscle in the shoulder to decrease the stress on the rotator cuff, provide stability to the shoulder joint and allow you to layer on strength to your shoulders. Finally, and something that is often overlooked, is the concept of endurance when it comes to a shoulder pain relieving program. The reality is your shoulder muscles to be able to work for a long period of time in order to prevent the shoulder joint into reshaping into a painful shoulder joint again. By focusing on endurance you can ensure the shoulder joint muscles will hold the shoulder joint in a pain-free position after shoulder reshaping has occurred. 1 out of 4 of my clients have shoulder pain of some kind. These clients consist of professional athletes, Moms, Dads, Everyday people who just want to be without shoulder pain during exercise. This program gives me a quick, natural fix to recommend to my clients instead of possible surgery, shots or medications that are temporary solutions. All my clients wanted was a natural fix. Thanks guys for this amazing product! 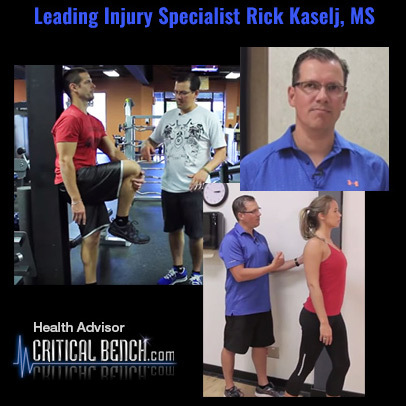 The entire industry looks at Rick Kaselj as the “Shoulder Injury Solution” expert and that’s because he speaks on the subject and has written and published more info on it than anyone else. FMSP Can Help. I fully recommend this program. After reviewing it I can say that Rick has put together a thorough guide for pinpointing potential causes of shoulder pain and several drills to correct your problems. 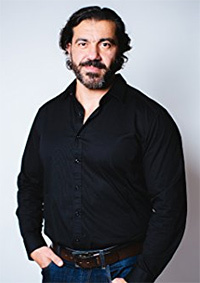 Whenever I have an injury that I need to address, I turn to Rick Kaselj, which is why I personally know you can trust him to keep your shoulders feeling like new. Thanks for putting this together Rick. 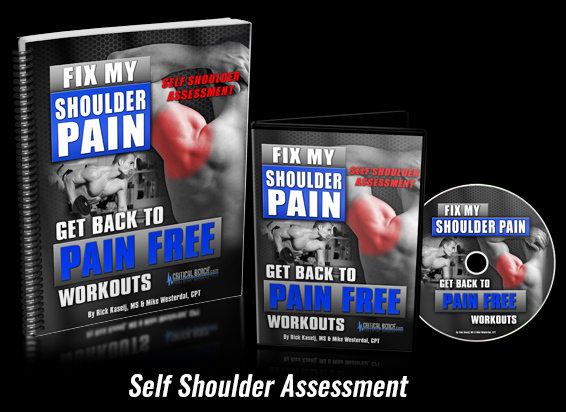 Rick will show you everything you need to do in the Fix My Shoulder Pain system. He will go through the 3-part program in detail using easy to follow videos and instructional guides so you can reshape your shoulder from a painful joint to a pain free joint. This will be an in-valuable time saver to help you dive right in and get started without any delay or questions. The video portion of this segment will help you determine “What Is Going On With Your Shoulder“. Rick will take you by the hand and walk you through your self-assessment. You can follow along with the online DVD. It will be great. 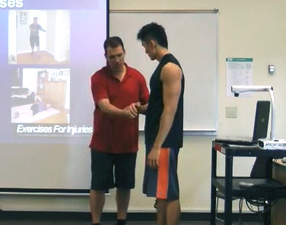 You’ll simply perform a movement that Rick shows you and based on how it feels you’ll know for sure what injury you have. The videos are very in depth but you are also provided with a quick PDF reference guide that summarizes and shows you how to do the assessment. If you ever need further clarification just refer to the online DVDs. Rick charges $150 per assessment with his local clients but it’s included in your package. This is the meat and potatoes of the system and where you get to implement the SR3 Method. With each individual injury you’ll be shown, what the injury is, what causes it, what makes it worse, and what you can start doing right away to make it feel better. Utilizing the SR3 Method you’ll focus on the 3-Parts. Alignment, Tissue Quality, and Activation & Endurance. This will reshape your shoulder from a painful shoulder to a pain-free shoulder joint. At this time you’ll be able to implement exercises and stretches because you have addressed the root cause and not the symptoms. The Online DVDs explain everything step-by-step. Or you can refer to your handy PDF for a quick reference guide to over 60-exercises and techniques you can start using immediately to alleviate pain and feel better in just minutes. This segment will save you time, money, heartache and ultimately your health when you no longer look to medication and surgery as the only alternative. The Bench Press is probably the most popular exercise in existence. Unfortunately a lot of people avoid it to due to shoulder pain but that doesn’t have to be the case. Rick put together a video guide to Pain Free Bench Pressing as launch bonus and I’m throwing in my already best selling Bench Press Explosion PDF where I not only show you how to perfect your form in an easy to understand step-by-step manner but you also get access to the very best 18 bench press specialization programs of all time. I’ve had the honor of picking the brains of some of the most powerful men in existence to create this book and now that your shoulders are finally going to be pain free you can start bench pressing again. If you are not 100% satisfied with this product and you feel that you didn't receive the value you were expecting, I will refund all your money. NO QUESTIONS ASKED! If that is Not Good Enough, Try the Fix My Shoulder Pain system For The Next 60 Days With A No-Risk, 100% Money Back Guarantee! “Test drive” the techniques for the next 60 days with absolutely no risk so you can fix your shoulder or rotator cuff injury and end your pain. 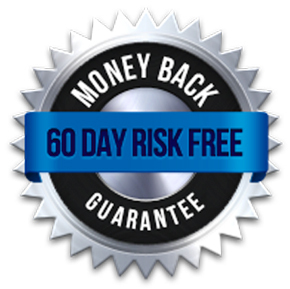 You can feel completely safe because you are protected by this iron clad 100% money back guarantee. 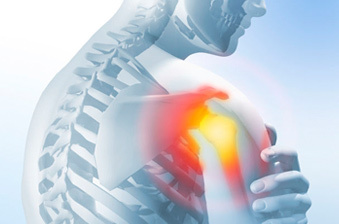 You will not only be satisfied, I guarantee you will be thrilled and amazed with the Fix My Shoulder Pain system, or you can simply email us and ask for a prompt and courteous, no hassles, no questions asked, 100% refund. In fact, if you’re not completely happy for any reason at all, then I insist that you ask for a refund. However, after seeing so many men and women end their Shoulder Pain in a quick and effective manner, I am confident that you will be thrilled as well. Don’t Avoid Your Shoulder Pain – Eliminate It! I really want to stress this to you. If you’re feeling frustrated trying to end your annoying shoulder pain, and for whatever reason… what you’re trying isn’t working, then let Rick help you. Rick helps athletes and serious fitness enthusiasts get back to what they have a passion for instead of telling them to stop training. Whether you currently have a shoulder injury or if you have shoulder pain that has been lingering off and on for way too long, Fix My Shoulder Pain will benefit you more than you can imagine. You’ll learn the exact same techniques that I utilized to reshape my shoulder to a pain free state… so I was finally able to get back to my workouts full force without any distractions. These are the same methods that Rick teaches his own local clients as well as health and fitness professionals across the United States and Canada. You’ve got nothing to lose but unnecessary aches and pains. Join us right now and finally address the root cause of your shoulder pain safely without getting the run-around or getting talked into expensive appointments, medications or surgery. P.S. 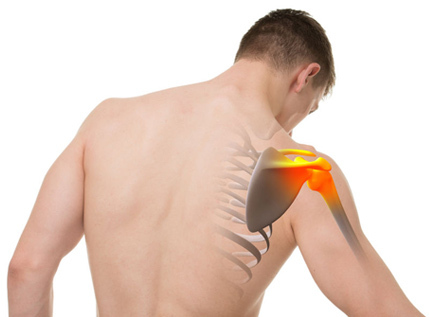 – There is NO RISK at all for you when you try the Fix My Shoulder Pain System. If you are not thrilled with how this system decreases your pain, let us know and we will refund your order. Your satisfaction is 100% guaranteed. Rick Kaselj and I have been trusted by the largest fitness & rehabilitation associations in North America (NSCA, ACE, CanFitPro, BCRPA, BCAK, CKA, NHPC). P.P.S. Whether you’re trying to avoid surgery, recover from surgery, get of meds, get some sleep, prevent things from getting worse or just want to end some nagging pain, Fix My Shoulder Pain is for you. 49-Year Old Mother of Two Challenges You! I’m known for my challenge workouts that I put myself and hundreds of clients through. Pull ups and push ups are a huge part of my program and I’m thankful to have access to Rick and his Fix My Shoulder Pain techniques so that my clients and I can keep attacking our workouts with 100% intensity. If you’re serious about your workouts I challenge YOU to use Fix My Shoulder Pain and feel the difference. With this heavy and intense lifting that my clients and I do, it’s imperative that we understand how to not just treat, but PREVENT any shoulder pain that might exist from the work we put in. Rick’s methods have proven to keep us healthy so that we can train confidently and continue to bust through old plateaus! Push ups are a staple in my programs and finishers. 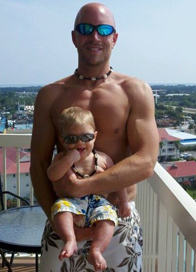 Unfortunately, I had a client that was dealing with nagging shoulder pain whenever he performed pushups. He almost felt defeated. 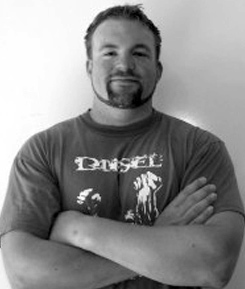 But once I got feedback from Rick Kaselj and implemented his advise, my client was doing push ups pain-free. That is just one reason Rick is my go-to resource when it comes to dealing with shoulder pain. He Hit The Nail On The Head For Me! I have to say what Rick is saying is absolutely dead on. He hit the nail on the head for me! I dutifully did all of my physical therapy sessions and followed the at-home physical therapy to a “T”, but felt like I started stiffening up within the first 2 ½ weeks. No matter how many more stretches I did, I would always take 2 steps forward and 1 sometimes 2 back. I could never get ahead of it, until now. Thanks so much for the info, I 100% recommend Fix MY Shoulder Pain for anyone who is dealing with idiopathic frozen shoulder!!!!! Rick Kaselj has put together the most comprehensive online shoulder rehab program I have ever seen. Rick has managed to include all the elements you will find in a clinical rehab setting. If your shoulder pain is limiting you from enjoying the activities of your choice, this is a great place to start! After two years of rehab with little progress, it only took two weeks of working with Rick to notice an increase in my range of motion and my re-occurring muscle tightness started to decline. I would recommend Rick to anyone with hard to pinpoint and nagging injuries of the shoulder/rotator cuff and muscles that lead to the neck. I am very pleased with the results and I continue to work with Rick. Q: Do I have to stop working out while I do the Fix My Shoulder Pain Program? A: No, you do not. For many of Rick’s clients, he blends it into their program. Many times he takes out ineffective stretching and strengthening and puts in SR3 method exercises which end up only adding 5 minutes to their workout. Q: Do I need any special equipment or gym membership to follow this? A: No, many of the pieces of equipment suggested are commonly found around the house or can be found at a department store for a few dollars. You don’t need a gym membership to do the program but it you do have a gym membership you can do the program at the gym. A: This will work for people any age from teenagers to the golden years. In fact the older you are the better it will work. Years of gravity work on our shoulders often times leads to the shoulder reshaping into a painful shoulder. Fix My Shoulder Pain helps you reshape your shoulder into a pain-free shoulder joint using concepts and movements that most therapist don’t know about. Q: I want to start using Fix My Shoulder Pain right now. Do I have to wait for the program to come in the mail? A: You don’t have to wait, you can have access in just a few moments. FMSP is a digital product so don’t worry about shipping fees or delaying results. Q: Does Fix My Shoulder Pain work for men and women? A: It works for both. Men and women are different but the shoulder joint is exactly the same. Q: Why haven’t I heard about the SR3 Method before? A: Frankly this information is brand new and nobody else is talking about it yet. Rick is an injury specialist that teaches other health and fitness professionals his injury prevention and recovery methods. This time the results have been so amazing he’s decided to help more people faster by offering this new technology directly to the end user. A: Yes, follow the SR3 Method and you will feel better in minutes. I did not say your pain would be gone but I know when you see the program follow the 3-parts to it, you will see program is different anything you have seen or done and how easy it is to do and begin the journey to a pain-free shoulder. Q: How long do I need to follow the Fix My Shoulder Pain system to get the best results? A: You need to perform the program consistently for 1-month to get best possible results. Q: What if I’ve already had surgery in the past, is Fix My Shoulder Pain safe for me? Yes, it will. The 3-parts of the SR3 method will benefit you and help continue to reshape your shoulder joint into a pain free shoulder joint. Q: My shoulder pain isn’t that serious it’s more of just a nuisance, will I benefit from the system? Q: I’ve been searching around online and found other shoulder strengthening and stretching exercises for shoulder pain, can’t I just follow those? A: That’s probably not a good idea. It’s hard to know if the information you’re finding is reliable and we’ve also learned that until you reshape your shoulder to a pain free joint all the strengthening and stretching exercises will at best offer temporary relief. 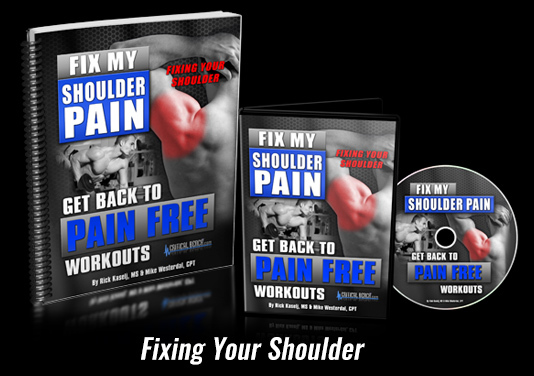 NOTE: Fix My Shoulder Pain ePackage published by Critical Bench is a set of completely downloadable pdf and mp4 files. No physical products will be shipped. After you order, you’ll get INSTANT ACCESS to download all product components onto your computer. The format for all manuals, workbooks, checklists, etc, is adobe acrobat PDF and MP4, which can be viewed on Mac or PC. Individual results may vary and just because you buy this program does not mean that it will work as good for you as did for others. Like all things in life you’ll get out of it what you put into it so if you just buy this and DO NOT put it to use you’re not going to fix your knee pain.